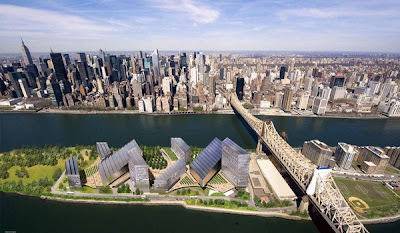 "If Cornell University were to win the city’s competition to build a new science graduate school, it would install on Roosevelt Island almost four acres of solar panels, 500 geothermal wells, and buildings with the rare distinction of generating as much power as they use. Stanford University’s proposal for the island calls for minimizing energy use, creating a marsh to filter water, and recycling water from storm runoff and sinks, and possibly from toilets as well. [...] As the Oct. 28 deadline for proposals was approaching, several of the top contenders discussed their environmental plans as part of a public relations war intended to impress city officials who will decide which institution wins up to $400 million in land and infrastructure improvements. Stanford and Cornell, vying for the same city-owned site on what some involved in the process have begun to call Silicon Island, are widely seen as the universities to beat." Very compelling! I believe this new New York campus will be one more key step to creating a networked family of top-tier tech-uni's, kind of a World Institutes of Technology & Science!